Cherne has added Clean-Seal 2 to their broad offering of DWV test products. 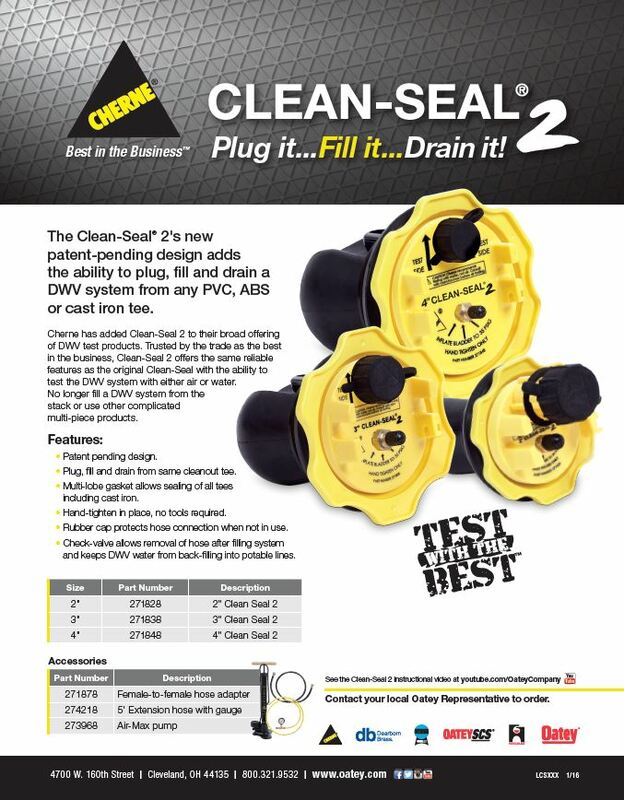 Trusted by many tradesmen as the best in the business, Clean-Seal 2 offers the same reliable features as the original Clean-Seal with the ability to test the DWV system with either air or water. Test from any PVC, ABS or cast iron tee. With this product, you no longer need to fill a DWV system from the stack or use other complicated multi-piece products. • Plug, fill and drain from same cleanout tee. • Multi-lobe gasket allows sealing of all tees including cast iron. • Hand-tighten in place, no tools required. • Rubber cap protects hose connection when not in use. • Check-valve allows removal of hose after filling system and keeps DWV water from back-filling into potable lines.